Allow the professional team at G & O Construction Contractors Inc. to provide a wide array of services relating to your commercial or residential property. Contact us for a FREE estimate. Do you need snow removal services? 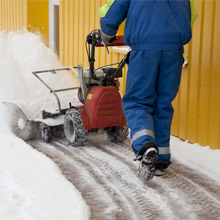 We provide salting, sanding, stacking, and roof snow removal. Tell us about your project and we will aim to meet all of your expectations. We also do roofing and new construction.